"Here, for the first time, Dennis gives his account of the ideas, adventures, and anguishes he and Terence shared—and some they didn’t. 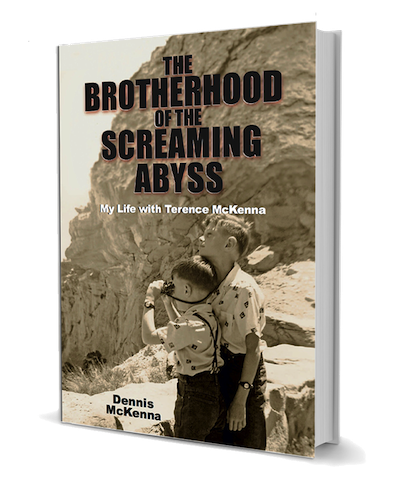 This sweeping account will appeal to anyone interested in Terence McKenna, of course, but ultimately it is the story of two men, and two fates, that only Dennis McKenna could tell." This is a notice to my customers that I no longer have soft-cover copies of my memoir, The Brotherhood of the Screaming Abyss. Thanks to your steady business and support over the last 6 years, we have now sold all available soft-cover copies. You can still purchase the hard-cover copies from this website at $79.95 per copy for a signed, numbered, limited edition. The hardcover books without signatures are still available on Amazon.com and also from AbeBooks.com at this link. The cost of the unsigned books from these sources are $30 + shipping. Kindle versions of the ebook are still available at this website and on Amazon. BSA on All Your Devices!